The APT MULTI-CHANNEL CODEC is a compact and efficient solution for the transport of multiple channels of audio or MPX content over IP links. It can support up to 16 channels of audio within a single unit of rackspace - and even more IP streams when using multicast or multiple unicast technology. A Dante Interface module enables direct connection to Dante or AES 67 networks. The 1RU frame can accommodate up to 4 AoIP modules, each equivalent to a stand-alone stereo duplex codec combining audio, dual IP transport and auxiliary data on board. It offers the entire range of audio formats and modes meeting the audio industry’s requirements: simplex, duplex, AES/EBU, AES/EBU with analog backup, analog with HI/LO or 600Ω impedance. The APT AoIP Codec Module offers audio encoding/decoding, IP transport, management and auxiliary data on a single, plug-in module. This enhances the Audio over IP performance of the APT Multi-Channel Codec System as well as increasing its scalability and flexibility. Fully compatible with the many hundreds of existing units already deployed worldwide, each AoIP card can deliver two independent stereo audio channels on multiple IP streams using multiple unicast or multicast. The APT AoIP codec module offers the entire range of audio formats and modes meeting the audio industry’s requirements: simplex, duplex, AES/EBU, AES/EBU with analog backup, analog with HI/LO or 600Ω impedance. The module offers the same broadcast-grade audio for which the Multi-Channel Frame is renowned with support for a wealth of standards such as: Linear PCM 16/24Bit, aptX® Enhanced16/24Bit, MPEG1/2 LII, MPEG2 HE-AAC & HE-AACv2, MPEG4 AAC LC/LD/ELD, HE-AACv1/v2 . The APT AoIP Codec Module is also able to support 85kHz of audio bandwidth and scale the sample rate to 192kHz, enabling a digital MPX signal to be sent on an AES stream. The output of the audio codec can therefore be transferred directly to the modulator of the exciter. This 100% digital path eliminates D/A and A/D conversions which may cause degradation of signal quality and could introduce distortion. SureStream technology is a revolutionary innovation from APT that enables broadcasters to use inexpensive IP links and still maintain professional broadcast-grade audio quality and reliability. It delivers the audio quality and reliability you expect from a T1/E1 link at a fraction of the associated cost. 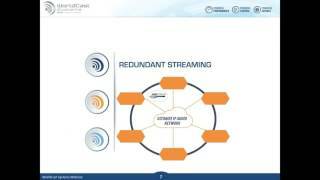 APT SureStream Technology also offers the added benefit of «Always-On Redundancy». With APT SureStream Technology, you can save thousands on your audio transport bills and still offer your listeners the highest quality sound. The APT AoIP Codec Module is also able to support 85kHz or 64kHz of audio bandwidth and scale the sample rate to 192kHz or 128kHz, enabling a digital MPX signal to be sent on an AES stream. The output of the audio codec can therefore be transferred directly to the modulator of the exciter. This 100% digital path eliminates D/A and A/D conversions which may cause degradation of signal quality and could introduce distortion.